Fauré's Dans les ruines d'une abbaye from his 2 Songs, Op. 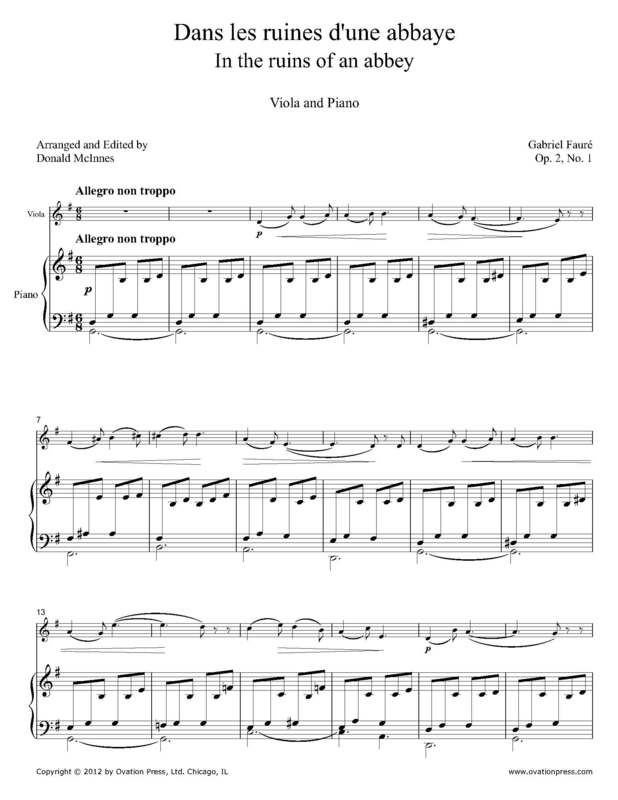 2 has been arranged for viola solo and piano by the world-famous violist Donald McInnes, who held a professorship at the University of Southern California from 1985 to 2014 and is known in virtually every corner of the artistic world for his appearances with major orchestras, recitals, chamber music participation, and numerous master classes. The first of Fauré's Two Songs, Op. 2, Dans les ruines d'une abbaye is a setting of a poem by Victor Hugo. The original lyrics paint the picture of newlyweds outdoors in springtime on the grounds of an old abbey, their vivacious peals of joy and laughter in defiant contrast to the sombre shadows cast by clerical history. Even the tombstones inscribed with crosses, and thoughts of the praying nuns of yore, cannot dampen this young couple’s fun and games. Download and print the score today to gain access to this expertly edited arrangement of Fauré's Dans les ruines d'une abbaye for viola and piano by Donald McInnes! Below is the original French text by Victor Hugo. An English translation is available here. Seuls tous deux, ravis, chantants!